We aim to provide all our customers with the highest standards of service and facilities. Our staff are on duty 24 hours a day, 365 days a year. The Marina & Harbour Site is staffed 24 hours a day and maintains a listening watch on Channel 80/M2. All vessels are asked to call prior to entering or leaving the marina and harbour basins. Marina staff also regularly patrol the site. Carrickfergus Marina is staffed 24hrs with security officers patrolling the Marina and Harbour during the night. CCTV is in operation throughout the Marina and Harbour Complex. Access for both Berth Holders and visiting boats is by swipe access card. Contract Berth Holders will be issued one swipe card with their initial contract. Berthing arrangements are all in place for the disabled. Safety ladders are located at each pile within the Marina Basin. Each red spinnaker unit contains a First Aid Kit, Fire Extinguisher and Life Ring. Download a copy of our Site Safety locations. Please do not remove safety items unless in an emergency. Remember alcohol and boating do not always mix. All Duty Officers at the Marina are fully trained in First Aid and Basic Life Support. A First Aid room with Cardiac Defibrillator is located at the Marina Office for use in an emergency. Please notify the Marina Office of any incidents particularly when 999 is called. This publication is available for viewing 24hrs at the Marina Office and also on our website here. All Contract Berthing Charges are payable in advance or monthly by Standing Order. All Visitor Berthing Charges are payable upon arrival. Please ensure your vessel is correctly moored and fendered with proper bow and stern lines and well placed springs. We cannot accept responsibility for any damage caused by inadequate moorings and/or fenders, particularly during stormy conditions. Cleats provided on the pontoons are of cast quality and shackles should NOT be used to secure lines to the cleats. These are based on guidelines issued by The Yacht Harbour Association and the British Marine Federation. All users are required to hold insurance cover of £2,000,000. All users should satisfy themselves that they have taken all reasonable precautions against theft. When navigating within the Marina and Harbour please listen on Channel 37/M1 or 80/M2. Navigation under sail or paddle alone is not permitted within the Marina and Harbour basins without the Harbour Master’s permission or by prior arrangement. Please observe the 4 knot dead slow speed limit and do not create excessive wash within the Marina & Harbour basins. Please observe the Bye-Laws and Terms & Conditions of Marina & Harbour use. The Marina Entrance Approach Light is located approx 30m to port of the red navigation beacon on the west breakwater. The light defines the centre approach line to the entrance. 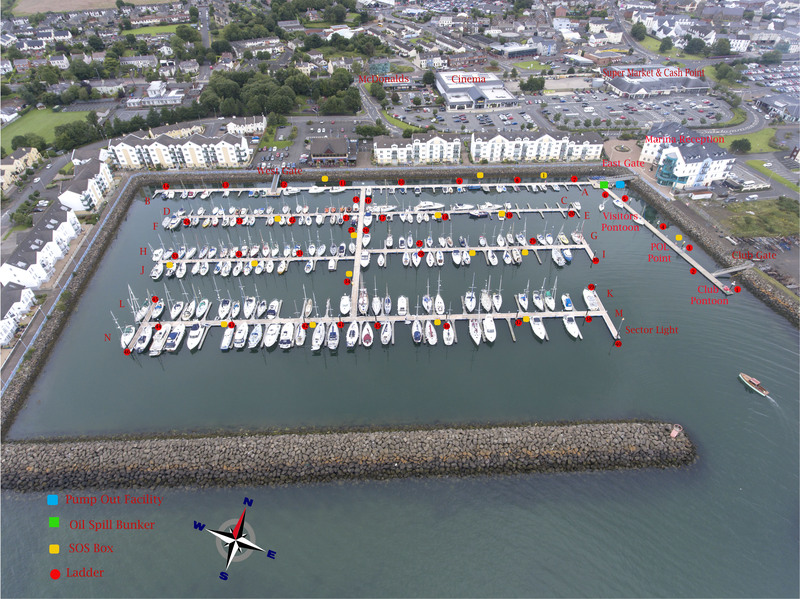 The information provided in relation to depths at Carrickfergus Marina and Harbour is a guideline only. It is the responsibility of skippers to satisfy themselves as to the availability of depths for their vessel at any particular time. Depths are checked and maintained as part of the Annual Maintenance Schedule. Shallow depths exist close to the breakwaters. We permit owners to live aboard with our prior consent. We do not permit houseboats within the Marina and Harbour basins. A waste oil disposal tank and battery disposal area are located within the Marine Services Area at the Harbour. Do not use your flushing heads in the Marina or Harbour basins. A pump out facility is located beside the East Gate Bridge in the Marina basin. Keys and nozzles may be obtained from the Marina Office. This complimentary facility can be used by all Berth Holders and visitors. Marina staff are always happy to give assistance. Marine diesel supplies are available on the fuel pontoon in the Harbour Basin. Please contact Carrick Marine Projects to arrange for supply. We are happy to hold keys to vessels for customers’ convenience and emergency access purposes. We reserve the right to refuse to accept keys of vessels for collection by third parties, unless by prior arrangement. The car park barrier is operated by both card and videocom. The Marina Access Gates and Service Area Access Gates are operated by both car and videocom. The Harbour Access Gates are operated by swipe card only. The videocoms are linked to the Marina Office in case of difficulty. If required, press the button for attention and speak normally into the microphone/speaker. The Marina staff can operate the barrier and gates from the Marina Office if necessary. Electricity is available to all berths 24hrs daily except during trips/faults. The supply is a 240 volt A/C connection. Contact the Marina Office to have your supply switched on. When leaving your berth, contact the Marina Office to have your supply switched off. Remember to disconnect your lead from the pontoon outlet before you leave the berth. Do not leave live cables on the pontoon. Report any damaged cables or spinnaker units to the Marina Office Immediately. Reasonable pressure exists at all times. Samples are taken by Environmental Health Department as required. Trolleys are provided for your convenience, please return to either gate after use. Do not overload your trolley, please ask for assistance when required. Children should not be permitted to ride in the trolleys. Full services are available in the exclusive Berth Holders’ Area. Facilities are regularly checked by duty staff and cleaned daily. Facilities are available 24 hours daily. Separate disabled shower/toilet facilities are also available. A 24hr Laundry Service operates, please contact Reception to take advantage of this service. General bins are located in the Service Area, at the top of the West Gate bridge and top of the Harbour Bridge. Recycling bins are located in the supermarket car park and the Harbour car park. Pets should not be exercised within the Marina or Harbour basins or car parks. Pets should not be allowed to foul the pontoons, access, nor car parks, nor cause any aggrevation to Marina users. Dogs should be kept on a lead when not on board. Public telephones are located, one at Reception and one within the Berth Holders’ Area. Additional phones are located within the supermarket adjacent to the Marina and in the Town Centre. One of the added benefits to being a ‘Berth Holder at Carrickfergus Marina’ is our complimentary WiFi. A daily forecast is published and displayed at both Marina Gates, the Harbour Gate and Reception. Staff are happy to access associated web sites and print relevant information if required. Berth Holders are welcome to carry out minor running repairs on their vessels, subject always to the Marina Terms & Conditions. Only Registered Contractors may carry out work to vessels within the Marina & Harbour Complex. Berth Holders should be aware that in the event of injury or damage being caused to the Council site or property by a Contractor who has not satisfied the Council’s Registered Contractors Requirements, the Berth Holder’s insurance will be deemed to be liable. All contractors are required to sign in at the Marina Office prior to commencing work. They should also sign out upon departure. Current insurance details should be provided to the Marina Office for a minimum of £5,000,000 liability cover. Details of how to register are available at the Marina Office. Hot work and grinding operations are only permitted by Registered Contractors. A Hot Work Permit must be obtained from the Duty Office prior to commencing any works.All work carried out must be in compliance with current Health & Safety legislation. The Maritime Rescue Sub Centre is situated at Bangor Marina. Navigational warnings are regularly broadcast by HMCG. A continuous VHF watch is maintained on Channel 16, Main Working Channel 67, Secondary 73. The nearest Customs Office is located in Belfast. Vessels requiring Customs services should call 0845 723 1110. Fast Ferry services operating in the Lough can cause wave wash which may be felt within the Marina and Harbour basins in certain conditions. A good lookout should be kept at all times. Carrickfergus’ slipway is located within Carrickfergus Harbour. Permission for use of the slipway is obtained via the Marina Office. We do not advise launching vessels for 2 hours on either side of low water. Please observe the 4 knot dead slow speed limit and do not create excessive wash within the Harbour. Please observe the Bye-Laws and Terms & Conditions of Marina & Harbour use. Vessels and owners use the slipway at their own risk at all times. All debris should be removed from the slipway after use. Please take extra care during cold and icy conditions. The pontoons, access bridges and adjacent areas are regularly gritted during frosty periods. Yachts and conventional ships have always shared the Lough in a responsible manner. Now they are joined by a third group, the fast ferries. All three groups can use the Lough in a safe and responsible manner, when sea sense prevails. The International Collision rules for powered and sailing vessels apply throughout the Lough. Know them and use them. Give early notice of your intentions, as Fast Ferries approach very quickly. Check the ferry times in your area. Watch out for Fast Ferry wave wash especially when launching or recovering boats. Swimming is not permitted within the confines of the Marina and Harbour basins. Diving operations are only permitted with the express permission of the Duty Officer and in compliance with current Health & Safety legislation. The Council’s Tourist Information Office is located within the Museum and Civic Centre in the Town Centre. It is open Monday to Saturday throughout the year. The Marina Office is a Local Information Office, and carries some brochures and leaflets on the surrounding area. Bus and train timetable information is available from Reception. Bus stops are located along the perimeter of the Marina and Harbour Complex. The train station is a short 5 minute walk away. Marina staff are happy to call a taxi for customers. Banks, Building Societies and cash points are located within the Town Centre, a short 5 minute walk from the Marina and Harbour Complex. Carrickfergus’ main Post Office is located within the Town Centre.